The Herbie Hancock voicing is a rich-sounding, two-handed minor 11th chord. The voicing contains a 5th interval in the left hand (Root & 5) and then four notes in the right hand (b3, 11, b7 & 9). The best way to learn the voicing is to memorise these scale degrees and then apply it to any minor key. The voicing is named after Herbie Hancock who is one of the most famous modern jazz pianists and composers. Herbie was one of the first jazz pianists to embrace synthesizers and funk music. This voicing definitely has a funky vibe to it! As the top note in the voicing is the 9th – look out for minor chords with the 9th in the melody and then simply slot this voicing underneath. We use lots of extended & altered harmony & also some interesting applications of inner voice movement, drop 2 and pentatonic voicings. Practice this voicing by taking it through all 12 keys. You can do this chromatically by moving up or down the keyboard. The voicing is more difficult to play in some keys - don't fret about this! 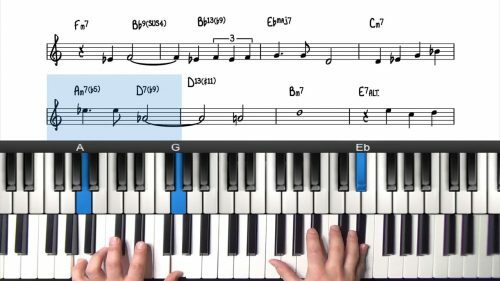 Just make a note of the keys that you can play it in and find alternate minor voicings to use for the other keys. Also try using the voicing in different registers of the piano. It sounds great in the lower registers because of the 5th interval in the left hand. Remember that the 5th interval can be played low down in the bass without sounding too muddy.